But is it a wonder fuel — or an energy-losing proposition? The grain-based alcohol called ethanol has been burned in cars since the days of Henry Ford. But thanks to unforeseen consequences of the Clean Air Act — and to perks in the energy bill — it’s enjoying a renaissance as an air-pollution-reducing gasoline additive. The 1990 Clean Air Act mandated that fuel sold in highly polluted areas meet strict emissions standards. To do that, gasoline companies began "oxygenating" their fuel by adding a chemical known as MTBE. But MTBE, a suspected cancer-causer, leaked out of underground tanks and fouled drinking water supplies in hundreds of communities. Now, with over a dozen states banning MTBE — and with ethanol as the only alternative approved for use in California, New York and Connecticut — grain fuel is booming. In November 2003, the ethanol industry set an all-time monthly production record of 194,000 barrels per day. The darling of farm-state politicians, including Sen. Tom Daschle, D-S.D., ethanol has hung on throughout the years primarily due to heavy government support. Since 1983, ethanol producers have enjoyed a federal subsidy of no less than 50 cents per gallon. In addition, corn producers have a subsidy in the form of a federally backed price floor of $1.89 per bushel. The energy bill now being debated in Congress would extend the ethanol subsidy for about a decade and require ethanol refiners to double production. Ethanol could grow from its current 2.75 billion gallons per year level to 10 billion gallons. Strong demand — coupled with powerful incentives — has pushed producers to expand westward, out of the traditional ethanol terrain of Iowa and Illinois. But while ethanol is being touted as an ecologically friendly, renewable wonder fuel, some critics are questioning whether it’s a source of energy, or a drain. In the Rocky Mountain West, ethanol production is taking off. A Spanish-owned company has a plant operating in Portales, N.M., and Wyoming Ethanol in Torrington, Wyo., plans to double its capacity in the next two years. 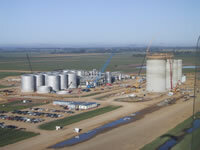 American Ethanol wants to build a high-protein wheat gluten/ethanol plant in Helena, Mont., and another company has been given all the permits necessary to build a $130 million wheat and barley ethanol/gluten facility in Moses Lake, Wash. At least five developers are considering building ethanol plants in Oregon, and Idaho is also poised to expand. But producers say it is hard to make money from ethanol alone, even with federal subsidies and the tax incentives offered by almost all the states. "We don’t make our margins on ethanol," says Dan Schwartzkapf of Wyoming Ethanol. "We make it on our byproducts." To tap markets for those byproducts — including spent grain and gluten products, which are used as animal feed — ethanol producers build their plants near the feedlots and mega-dairy operations that are sprouting up around the rural West. "B-level sites (such as those in the West) start to become very profitable," says Monte Shaw, a spokesman for the Renewable Fuels Association, a Washington, D.C.-based ethanol lobby. "A plant in Wyoming (where corn is more expensive) is never going to have as good economics as a plant in Iowa, but that doesn’t mean it can’t be a profitable plant." Nonetheless, there still are big questions about the economic viability of ethanol. In 1984, when gas prices were high, the number of ethanol plants in the U.S. peaked at 163. Two years later, when the bottom fell out of the energy market and gas prices plummeted, only 74 survived. Montana once had six ethanol plants; all of them have faded away or gone bankrupt. During the 1980s, New Mexico had 16 ethanol plants, most using irrigated milo, another grain. Now, it is down to the one in Portales. And although ethanol is touted as a boon to farmer cooperatives, the real beneficiary may be big agribusiness. Archer Daniels Midland (ADM), the world’s largest grain processor, produces around 40 percent of the nation’s ethanol, and benefits handsomely from the support and subsidies. "I think what most plants hope is that if they build and run a decent plant with appropriate costs, somebody like ADM will eventually come along and buy them up," says Montana State University’s Kevin McNew. A debate is also raging over whether the energy required to produce a gallon of ethanol exceeds the energy that a gallon of it can offer. A recent U.S. Department of Agriculture study declared that "the production of corn-ethanol is energy efficient, in that it yields 34 percent more energy than it takes to produce it, including growing the corn, harvesting it, transporting it, and distilling it into ethanol." But critics say that ethanol production wastes fossil-fuel energy. In a study published last year, Cornell University agricultural ecologist David Pimentel found that "about 29 percent more energy is used to produce a gallon of ethanol than the energy in a gallon of ethanol." Because corn production causes extensive erosion and uses large amounts of fertilizer and pesticides, Pimentel said, "subsidized ethanol production from U.S. corn is not a renewable energy source." "(The USDA study) is flawed because they omit about half the inputs in corn production," says Pimentel. That includes fossil fuel used by farm machinery, nitrogen fertilizer, and labor-intensive hybrid seed production. Such "inputs" can be especially high in the dry West. Nebraska, for example, irrigates about 80 percent of its corn, and uses natural gas to power its irrigation pumps. The USDA study found that Nebraska used twice the diesel and more than twice the amount of natural gas as a nine-state weighted average. And most of the water, according to University of Nebraska farm management specialist Doug Jose, comes from the Ogallala Aquifer, which is dropping 3-5 feet a year in some places. Research is being done into making ethanol from less energy-intensive crops, such as switchgrass and poplar trees, but critics like Pimentel say ethanol will never be an answer to energy needs. "It’s a loser all the way around," he says. "The money would be better spent on research in renewable energy technologies like wind or (solar) energy." The author is a freelance writer in Sheridan, Wyoming.